Emails purporting to be sent by Martin Lewis saying you've been 'pre-approved' for a loan are doing the rounds and should be deleted. 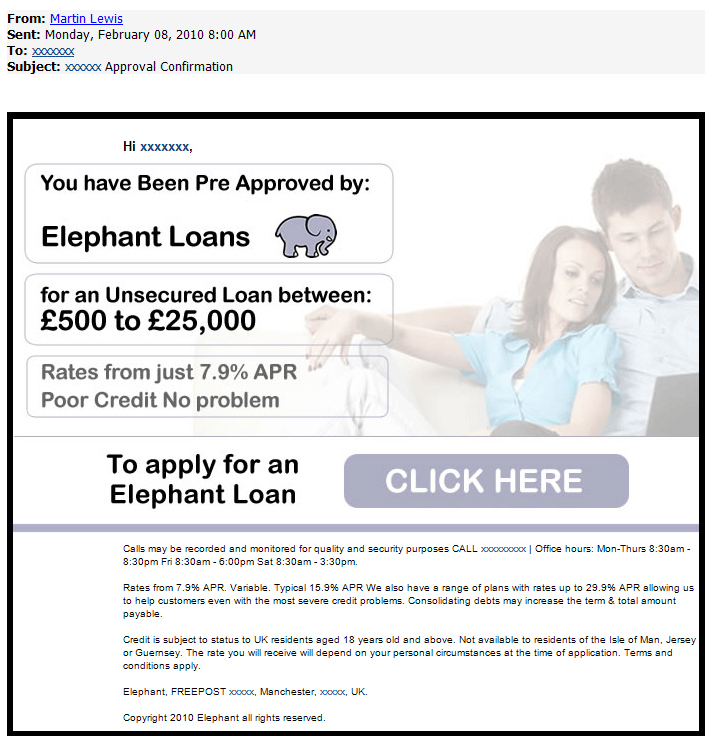 Numerous MoneySavers have alerted us to these emails over the past week which claim to offer borrowing from 'Elephant Loans' (see the Cheap Loans guide). We've also been asked on many occasions whether they are actually from Martin Lewis but they have nothing to do with him or MoneySavingExpert.com (MSE). The firm behind the emails, E Digital UK Limited, is effectively using our name and the Elephant Loans brand to sell loans. Yet Elephant Loans Limited, based at Regency House, Nottingham, went into liquidation in May 2008. E Digital UK is a third-party that gets commission by introducing clients to firms such as loan companies. This is the latest in a long line of tales of firms using the names MSE or Martin Lewis, whether accidently or deliberately, to sell products. The most extreme example came last year when we heard numerous reports of dodgy salesmen trying to flog financial products at Malaga airport on Spain's Costa Del Sol, claiming to be from MSE. Martin Lewis, MSE founder, says: "If you get an email in my name or claiming to be from MSE and it is not sent from our address or site, do not touch it with a bargepole. It is disgraceful if companies and individuals are trying to use the trust people have in this site. "And let me make it plain to anyone thinking of deliberately misleading by trying to use our name for gain. We will instruct lawyers and will take action to ensure MoneySavers are protected, so they know what the difference is between the real thing and imitations which may provide poor information or be a scam. "It's important to understand neither I nor MSE ever send emails other than the weekly money tip. Anyone calling up using my name or the site's name, or emailing from elsewhere pretending to be endorsed by us, is lying. Please ignore them and let us know." The loan email is confusing on a number of levels. Firstly, it is sent from an unrecognisable address. Also, the link on E Digital UK's email takes you to a page that looks like a loan application form, which states at the top: "Elephant offers loans for any purpose no matter what your credit status." Yet the small print on the site then says 'Elephant' does NOT provide loans. It states: "Your details will be passed to a third party licensed credit broker and Elephant-Loan (sic) is a trading style of E Digital UK ltd and E Digital UK ltd is not a licensed credit broker." The telephone number on the email, which is repeated on the web page linked to from the email, takes you to the Unsecured Loan Company, which is part of Best4Loans, a loan broker. There is no suggestion Best4Loans was involved in formatting the email or web page. Best4Loans managing director Mark Bowker says: "Although E Digital UK is an introducer of internet-generated loan enquiries we had no idea of the content of these emails and I am very concerned they appear to be sent from Martin Lewis." E Digital UK says the use of the name Martin Lewis was an accident. It says it uses many different combinations of first name and surnames on its emails, which changes every week. It has promised not to use Martin Lewis's name again, with emails over the next week scheduled to come from 'Andrew Jameson'. An E Digital UK spokesman says: "I apologise for any discrepancy and I will rectify the points made about the website and I am happy to email our distribution list saying we are not associated with MSE." E Digital UK Limited, based in Cheshire, should not be confused with E Digital Limited, a totally unconnected London-based firm.